The Incredibles: Rise of the Underminer is more for the kids than anything else. Adults will find the game begins to be a bit of a bore. For younger children who want to experience the Incredibles and play as a couple of the neatest super heroes who take on wave after wave of robotic baddies this is the perfect game that covers all platforms. I repeat though, adults may want to stay away from this one. There is not enough substance here to merit more than 30 minutes of play time for an adult. This game picks up more or less where the film and the last game left off. This time around you get to play as Mr. Incredible and Frozone. As with any super hero game there are big super hero sized crisis to take care of. This time around it’s saving the world from the top villain, or in this case the bottom villain. The underground dwelling Meany, The Underminer. What is interesting and actually kind of fun in this game is you’re able to switch back and forth between characters at any time. 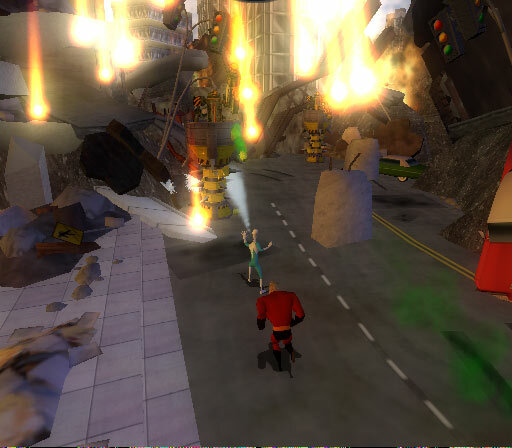 Both of them having different abilities come in handy and at key moments of the game you must use one rather than the other to complete a task to advance further. Often it’s not all that complex though, it just comes down to either muscle or ice really. 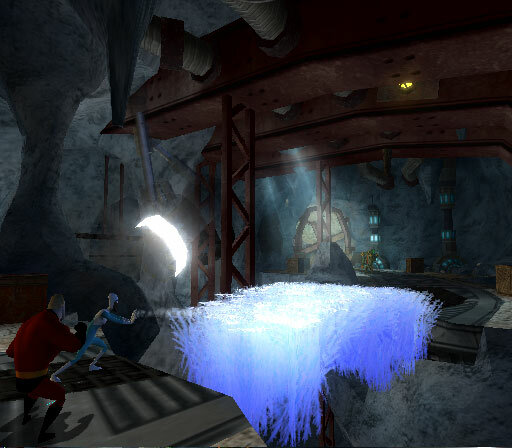 Frozone’s main abilities are of course shooting streams of ice and of course freezing objects and enemies. Mr. Incredible is only able to do simple moves of punching and pounding and sometimes picking things up and throwing them. Both Heroes are able to upgrade not only the abilities they start with, but can upgrade to new abilities as well. This is all very basic mind you; it just makes attacks such as punches more powerful and some increases in health, nothing really major that would prompt you to want to push for upping in levels really. Through out the game there are a lot of switches to be pulled to get onward in the game. Villains? Enemies? Well we have robots, lots and lots of robots, there seems to be no end of the waves of robots and turrets that our heroes must wade through for the final showdown. The game shows it was not really made for any one over maybe 6 years old because it is so linear and lacks any real appeal across the demographics of age groups. I guess I was hoping to have more an experience like the film; there was something there for everyone and not just children. If you as a gamer enjoy some challenges in your game play, do not stop here. The Incredibles Rise Of The Underminer is very linear and has no real challenge in it to speak of. It does have co op play so a pal can jump in and play the character that you’re not playing, but what is the use really? Two people playing just makes it even less of a challenge than just playing it alone. You can switch with your fellow player so you don’t have to get too bored stiff playing only one or the other character, so there is a tiny bone they throw you in the game. There are a lot of check points in the game which seem almost pointless since it is pretty simple all the way through. Controls for the game are pretty simplistic and do the job well. No multi button presses to have to memorize here. This is a good thing since I really don’t like to have to learn a huge amount of button presses really. Graphics are pretty good; everything has a pleasing amount of detail while not going over board on anything. The effects are pretty good with some nice explosions. There is not much of a variety to be had but again it does its job. There is not a lot of game play to speak of here but there is good presentation, the locations such as destroyed city streets, Caves with lava, and an interesting Ice area and of course the Underminer’s base of operations. Sound is pretty darn good and adds to the game and almost makes up for some of the limited parts. 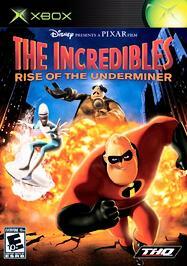 In the end and all is said and done, The Incredibles: Rise Of The Underminer is not for adults. Adults will most likely pass this one by, but that being said it is a good game for kids who enjoyed the moves and want more and maybe even dream of being a superhero like Mr. Incredible or Frozone.